As an entrepreneur, you should make sure that your market stays for long, or hopefully for good. This is not just improvising your products and services. You have to make the customers feel like you’re offering them goods because you care for them, because you know it’s good for them. Add a little “people-friendly” tone to your approach and you can expect a relationship growing bigger between you and the market you have. No, you don’t have to meet with them one by one, given that you probably have plenty of customers to begin with. Fortunately, marketing is offering easier ways to do this without losing track of your business as you worry on keeping in touch with a lot of people. One of which is through SMS Marketing! Text messaging your market adds to that personal factor that you need. It makes your market feel like you’re really aiming for their support because you somehow personally messaged them in your mobile phone. Imagine millions of people who are on their mobiles right now, all within your reach. You will not only maintain your current market, but increase them as well. SMS Marketing lets phone users read your messages, announcements, and promos all in just a quick text from you. MyBusyBee’s PowerBlast offers SMS Marketing like no other! Expect your voice as a marketer be heard—or in this case, be read by millions of possible markets who are surely in their phones as you read this. What’s even better is the fact that they can reply to your messages for a more engaging series of texts. And talking to them adds up to a deeper relationship, right? 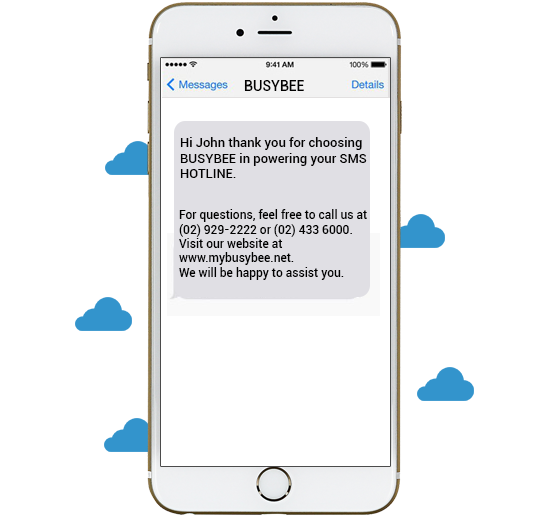 Get closer to your markets with BusyBee’s option of having phone users receive texts with their names on the message greeting! That way, your market won’t feel like you’re sending out messages to them because they’re in fact your market, it could feel like you’re sending out messages because you know what you offer is what they need. Be market-friendly! Interested? If you want more information on SMS Marketing just visit https://www.mybusybee.net/ or follow our Official Facebook Page at https://www.facebook.com/officialbusybee.textblast/and contact (02) 929-2222 or (63) 917-837-2000 and start establishing that relationship today! We Now Have 67 Million Internet Users in the Philippines – Reach Them Now! We Are Now with QUICKBOOKS!